15 September 2003 Whitehead Jun LOL 121. A new Junior Lodge was formed in Whitehead Orange Hall. More than twenty young people were initiated into the Junior Orange Association. The new Lodge received warrant 121 and the Lodge will be part of Larne Junior District even though it is attached to Whitehead Temperance LOL 968. The Officers from Larne Junior District officiated at the meeting. The Orange Hall was filled to capacity and all present thoroughly enjoyed the historic occasion. This is the first of several Junior Lodges that will be formed in the Carrickfergus area in the coming months and the brethren involved deserve credit for their work. 25 May 2003 LOL 787 Service. Woodburn Ebenezer LOL 787 held their Annual Service in Woodburn Presbyterian Church. There was a good turnout of Lodge members and several other Lodges were also represented at the Service. 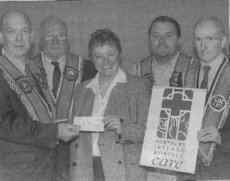 16 May 2003 Charity Donation . District Officers presented the Northern Ireland Hospice with a cheque for £500. The donation was the offering from the Carol Service that was held during December 2002. All the Lodges within the District also contributed to the gift. We look forward to increasing our donation to charity in the coming years. 11 May 2003 District RAPC Service. Carrickfergus District Royal Arch Purple Chapter held their Annual Service in Saint Patrick's Parish Church, Whitehead. The District Chapter were accompanied by Jordan Memorial Band who had new drums dedicated at the Service. The Service was thoroughly enjoyed by all present. The offering was donated to The Royal Arch Purple Benevolent Fund. 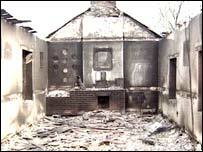 30 March 2003 Causanagh Orange Hall Attacked. An arson attack badly damaged an Orange hall.at Causanagh Road near Loughgall in County Armagh. Bibles and photographs were destroyed. Orange Order grand secretary and County Armagh Grand Master Denis Watson, said the attack had been despicable and one against the local community. "Those people who perpetrate such pointless and divisive actions don't want people to move forward in a new era of tolerance and respect for each other. They prefer to continue to polarise the local community when they cannot even respect the Orange brethren and the tradition they hold dear." This is the work of mindless bigots. Police have appealed for anyone with information about the attack to contact them. 27 January 2003 Moree Orange Hall Attacked. On the early hours of Monday 27th January 2003, part of Moree Orange Hall was destroyed when a mechanical digger was used to attack the hall. The digger was stolen from a nearby landfill site, before being driven through the perimeter fence and demolishing a large section of the hall's exterior wall. Extensive damage was also done to the roof of the hall. 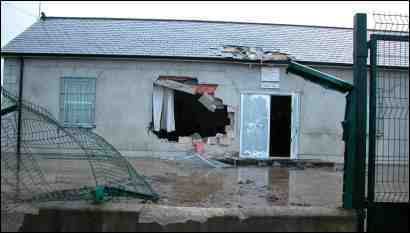 This latest attack follows in the wake of a number of other previous attempts to destroy the Orange hall. In 1997, Moree Orange Hall was completely gutted by fire caused deliberately by Republicans. "In the previous times, there have been about six attacks on this hall-arson, stone-throwing, minor attacks, major attacks." The Orange Hall is not only the home of Moree Temperance LOL 195, but it serves as a community hall, being the home of a number of community groups, including a youth group, Moree Community Association and the newly formed Crossroads Cuisine. Although a setback, I know this latest incident will not deter from the active and vibrant community spirit that is a credit to the people of Moree. 4 January 2003 Installation of Officers. The installation of District Officers for 2003 took place in The King William III Memorial Orange Hall. The Deputy County Grand Master and County Grand Chaplain officiated.